ACCELERATED solvent extraction (ASE) is a well-known method to greatly speed up the concentration of semi-solid and solid samples by employing elevated temperatures and pressures to remove solvents more quickly than would otherwise be possible. Genevac has now launched a new laboratory tool, called Flip-Flop, to speed up the sample preparation process further by eliminating various steps in the post-ASE workload. 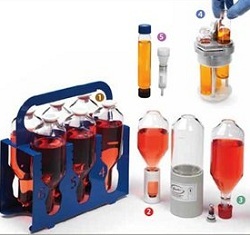 Special Flip-Flop tubes are used to collect samples, and these tubes are then fitted with a funnel and vial before being inverted and a second cap removed. The post-ASE sample is then concentrated directly into a GC autosampler vial using the Rocket evaporator from Genevac, which enables rapid simultaneous concentration or evaporation in up to 18 Dionex ASE vials. This procedure eliminates manual transfer steps, speeding laboratory workflow and increasing the reproducibility of results.